This school holiday, wonder how to keep your children occupied? Come engage your kids in our colourful holiday art activities such as drawing / painting class, clay class, collage class, canvas painting class etc designed for children / teens / adults age 4 years & older. 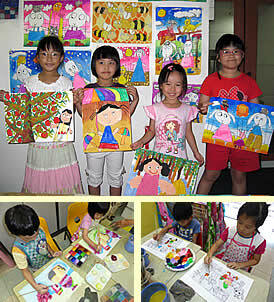 Children will learn to draw & paint different subjects each lesson using different art media and through the understanding of shape, size, proportion & colour scheme (more art techniques / media we teach). Children will acquire higher artistic confidence, broaden general knowledge and enhance creativity through our story-telling and drawing demonstration of the various subjects. Suitable for children age 4 - 12 years. This is a guided beginner class for all painters, with or without knowledge of art. 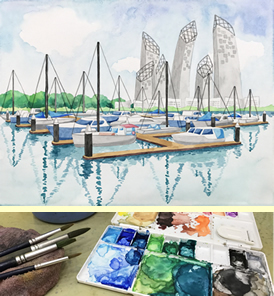 Participants will learn basic proportion & perspective drawing, layering of watercolour washes, blending technique and colour mixing to depict the appearance of the images in the painting. Suitable for teens age 13 years - adults. Attention, Anime / Manga lovers! Here's your chance to exercise your expertise in Anime / Manga drawing. 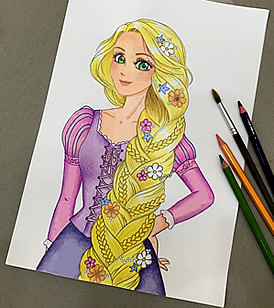 In this class, students will learn to sharpen and enhance their Anime / Manga drawing skills by re-designing the classic beauty, Rapunzel, into Anime / Manga style. Participants will be taught pencil sketching techniques to first draw out the character, then colour-pencil shading and water-colour painting teachniques to complete their drawings. Suitable for kids, teens & adults age 9 years & above. 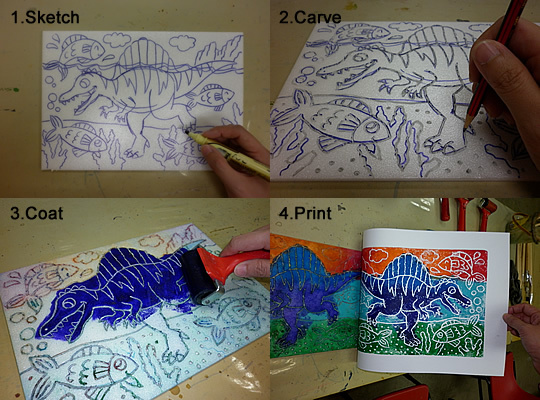 Children will each choose a canvas printed with their desired landmark and be guided to paint on them. 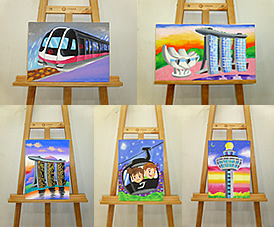 The canvases are printed with Singapore landmarks which are exclusively designed by My Art Pencil. The designs include Marina Bay Sands, Changi Airport, MRT train and Singapore cable car. Kids can choose a different landmark to paint for every session. These canvases had received overwhelming popularity at our public on-the-spot art jams held at various locations (event pictures). If you had missed those events, don't miss this opportunity to own one of these limited edition canvases. More pictures. You can also purchase these canvases from us, see all designs. Suitable for children age 6 - 12 years. What colour scheme do you want for your Christmas tree? Rainbow, blue, purple, pink, gold or green? 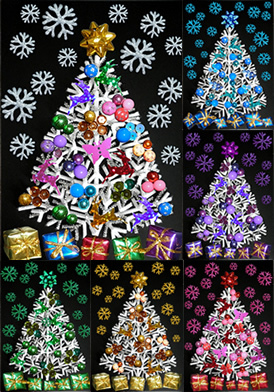 In this class, participants will each create a textured Christmas tree using various craft materials like beads, sequins, star ribbon bow, mini 3D presents, wired tinsel, pipe cleaner and add snowflakes around the tree using glitter glue. This class allows participants to learn through their sense of touch and teaches them the way to cut, twist, bend and paste materials to achieve the shapes they wish to create. In the process of adding different layers to the artwork, students learn the concept of foreground, middleground and background. Suitable for children & teens age 6 - 16 years. 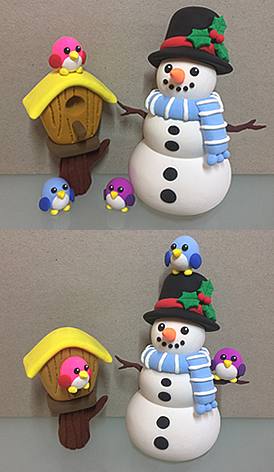 Participants will learn to mould and sculpture a snowman, his bird friend and a bird house using air-dry clay. In the process of shaping and decorating their sculptures, participants can acquire various kneading, carving and moulding skills. They will also be taught the way to mix different coloured clays into their desired colours and carve details on their clays using various tools to achieve more realistic effects on their sculptures. 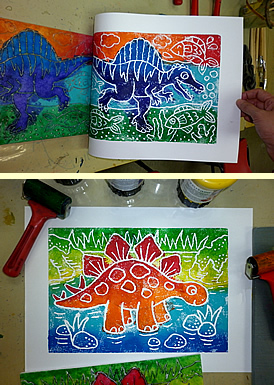 Back by popular demand, we are offering this June holiday workshop again in the coming September school holiday. Such wood craft workshop is first of its kind at My Art Pencil and we are offering it as a special programme for our 10th anniversary. Participants will be taught to create this ferris wheel by putting together wooden / wood-like materials such as ice-cream stick, disposable chopstick and satay stick. This 13-inch-tall wood craft is a replica of an actual ferris wheel as it operates just like the real thing. Not only has it got functional rainbow-coloured seats that allow you to load your mini figurines, more importantly, it can spin a 360 degree, giving your mini figurines a complete ferris-wheel ride. Watch video. Suitable for participants age 6 - adult. The holiday class schedule will be out 2 - 4 weeks before the start of every school holidays. For holiday class details, fees and schedule, click here.